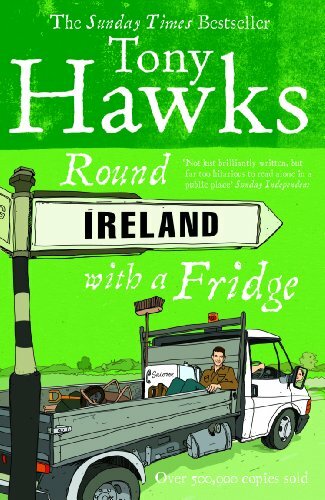 You have to be very drunk to bet somebody, that you would be able to hitchhike around Ireland with a fridge. Apparently the author was. The result is a unique travel account, at times hilarious, even though I have to admit that I did not finish the book. Somehow the oddness of the situation, and with it the fun, gradually wears off. But even if you don't finish the book, I think it's well worth reading. Some people even read my wishlist... thanks I really appreciate it! I just loved reading this book! Even if some of the jokes were a bit dumb, most of them made me laugh. And as my travel-budy could confirm, laugh out LOUD :-) This story is so hilarious I will remember it for quite some time and if I need something to smile about, I'll think of Tony and his fridge. Given to me by sun-beetle at last night's bookclub. Thanks! What a lovely booK! I too laughed out loud whilst reading it! My hubbie is irish, and we've visited quite a lot of places on the west coast of Ireland. We too have experienced the "lock in" of these small pubs. In one case, the pub landlord disappeared for an hour, the locals kept pulling the pints and leaving money on the counter, and then the barman reappeared in his pajamas and dressing gown at about 2/3 am and continued serving!! "There is something soothing and reassuring about tea- and coffee-making facilities in a room. I delight in all the intricate packagins of the tea, coffee, sugar and milk, and draw enormous pleasure from the ritual of filling the lightweight kettle, struggling to find the power power, and being unsure of whether pushing the button in at the back of the kettle has turned it on or off. For me, once I've made a cup of tea I belong somewhere. It's like I'm marking out my territory, and anyone attempting to come and make a cup of tea on my patch will be dealt with most severely, more likely than not with a counter attach into their territory and the seizure of their milk cartons and shortbread biscuits." Not sure what I will do with this book. It will stay at home on my non-existent bookshelves for the time being, but is available for loans / trades / RABCKs. Thanks for borrowing me the book. I found it in my mailbox today. I did a roundtrip through Ireland this summer, not with a fridge though but with a bunch of friends. I fell in love with that country and I'm looking foreward to read that book as soon as possible. Thanks again. The book was really great, in Summer 2005 I did almost the same trip as Tony just without fridge. And I recognized many things he wrote about. Thank you for borrowing me the book and sorry again for the the long time it had to stay with me. Safely returned home - thanks jsama!